Mario is a surprisingly active fellow. We've said it before and we'll say it again — the doughy little guy is a total sports nut, and he owes much of this to the kind developers at Camelot, who have a gift for creating really solid titles that allow him to strut his stuff. Like previous titles in the Mario Golf series, Mario Golf: Advance Tour was released as part of a duo, and arrived fairly soon after the release of its GameCube counterpart to allow for some golfing on the go. What could have been a quick port ended up as a compelling title in its own right, and one brought to life by some solid role-playing elements. Though you can immediately play as Mario and friends in a variety of quick-play modes, the real stars this time are actually a group of unknowns, with the player choosing between either Neil or Ella as their main character. These young players have trained under the legendary ‘Kid’, who has come out of retirement to compete alongside them at the prestigious — and deceptively palatial — Marion clubhouse. Your goal is to eventually take on the plumber himself, whose face is emblazoned in stained glass right in the foyer. This simple setup puts you right into the story and the colourful, 16-bit feel helps set the tone for the adventure to come. Purists can skip through most of the exploration and get right to the tournaments for a streamlined career mode, but it’s well worth your while to roam around the clubhouse grounds and make the most of the huge range of activities on offer. Almost everything you do in story mode will earn experience points, which you can eventually use to level up your character however you like. Whoever you didn’t choose will step in as your AI partner for occasional doubles matches, with excess points keeping them up to scratch as well. As we’ve mentioned, there are tournaments in which you can compete — helping you advance to the next club — in addition to opportunities to scope out tricky courses and practice on specific sections, find other golfers to talk to for advice, and training sessions used to hone some advanced skills. Even poking around the environment often yields power-up items or quirky references to Nintendo characters. There’s nothing quite like coming off the greens, opening a locker and stepping on Lakitu’s glasses like you don’t even care. Advance Tour owes a lot to its predecessor on the Game Boy Color, borrowing the same general concept and elevating it all to new heights. The golfing mechanics remain much the same, utilising the tried-and-tested swing metre and tweaking it just enough to allow for some experienced manoeuvres. First timers may feel a bit overwhelmed, as there’s no shortage of golf-lingo used throughout (the game even features a built-in glossary) and the slightest change can radically alter your shot, but it doesn’t take long to get into the swing of things. The entire course can be shown from a top-down perspective, and recommended clubs are chosen automatically depending on the shot; you can progress at your own pace while steadily getting a more manual feel for the game. Eventually you’ll need to pull off some topspin or perfect the angle of your curve to keep ahead of the competition, and the new ability to alter your point of contact mid-swing adds yet another layer of strategy. Again, it pays to enter practice sessions, as the pros will teach you specific shots and even when to use them. Our only advice is to focus on the D-Pad when using the GamePad controller, as the control stick can end up feeling ever so slightly imprecise. There are plenty of non-traditional gameplay options here as well, either through the story or quickplay mode, and it’s definitely enough to keep things interesting. There’s a slot machine-style golf course where every condition is randomized, a variation on Ring Shot mode called Go-Go gates where your shots need to pass through a particular target, and modes to test both your speed and accuracy. The more you play as your main character, the more you’ll unlock for quickplay and local multiplayer, such as ‘Mushroom’ versions of the courses that add a distinctly Mario-esque aesthetic, and further characters each with their own unique stats. Though it is of course impossible to sync characters with the GameCube version or link up with other players any more, the Wii U version still allows for local competition in any gameplay mode by simply passing the GamePad from player to player, and this works just fine. As a relatively solitary sport, golf lends itself well to this compromise, and once you’re all at a similar skill level it can actually get pretty intense. Visually, Advance Tour is a treat, striking the right balance between atmosphere and clarity to improve both exploration and the game itself. The world is bright and appealing, with chunky sprites and lush environments to draw you in, while out on the courses it switches between three different perspectives to help you set up a shot. The top down view gives the lay of the land, a behind the back view precedes your swing (which often sends a tuft of grass skyward) and an expanded 3D view helps plan the curve of your shot. It’s testament to the versatility of the GBA, and leaves little room for complaint when it comes to your view of the action. We’re happy to report that the announcer makes a welcome return here as well, with actual clips of speech popping up regularly during gameplay. Off-course, the dialogue is represented by text and the usual bleeping, but once you’re in-game it’s common to hear your character shout out in celebration of a powerful shot, and this is especially the case when playing as one of the Mario crew. 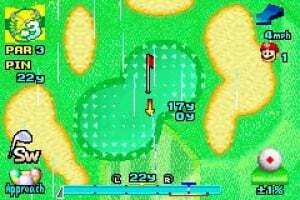 The music is typically cheery and pleasant, if a little bland, but once you’re setting up for a putt shot it switches dynamically to amp up the tension. Characters’ emotions are animated by pop-up smileys, and when they get an idea it’s indicated by the iconic tone of a Game Boy turning on. Little touches like this, alongside the birdsong and ambient sound effects dotted throughout, really help the sound design stand out. Advance Tour is a fantastic portable golf game and then some. There's enough here for hours of gameplay, and though some might feel the RPG elements only interrupt the core gameplay, there's a genuine reward for exploration thanks to the level-up system. Everything works so well that Camelot barely even needs to rely on its stable of Mario characters to flesh out the experience, instead sending the player on an involving journey of their own. With local multiplayer options, this ends up transitioning to home console very well indeed, and is well worth a look for anyone that's ready for tee-time. Like golden sun, so...way too much text? And the pause menu mapped to the A button? what? does this game support multiplayer? I thought VC GBA games wouldn't support multiplayer gameplay! @ghasfarost Same-console multiplayer, and you literally just pass the same gamepad from player to player. It's basic but it works well! Did somebody just mention Golden Sun?!!! Seriously, Camelot's best games were on the GBA. Gotta try this one. Loved Golden Sun 1+2, loved Mario Tennis: Power Tour, and probably going to love this one as well. 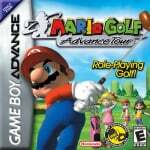 Haven't really played any of the Mario Golf games but I do like the golf games I have, and this being a Camelot game on GBA, I don't think I will be disappointed especially after reading this review. And that first picture looks very Golden Sun-ny. So how are we suppose to get Bowser, Wario, Waluigi, and Luigi unlock in this game now? We can't connect it to Toadstool Tour anymore. making this and mario tennis advance an RPG was a TERRIBLE idea!! This was one of my most played GBA games. The mechanics in it are perfect, I still think it's the best golf game ever made. I thought the RPG elements were really fun actually, wish they kept those alive in the gamecube and 3ds versions. I loved the originals on N64 and GBC. I didn't think much about Golf, for me it was slow and boring - until I played those great games. @AkDeath This. 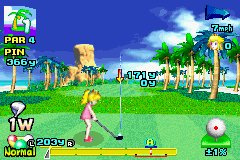 This game is my definitive Golf game, too bad the one on 3DS isn't like this. If you're on the edge, this game gets my highest recommendation. @xj0462 No it wasn't. It was the best thing to happen to these series...es. This was one of my fav GBA games back in the days! I really liked the rpg aspect. 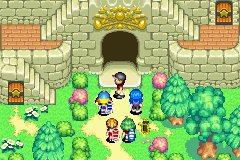 Loved this game on GBA, especially the RPG elements. 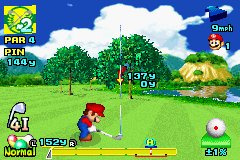 It's a shame they haven't done quite the same for the 3DS version of both Golf and Tennis. @xj0462 Explain how they were terrible ideas and people might actually listen to you. I never had any of the Mario Sports games, but I wanted to play them so bad as a kid! Might pick this up eventually! This was an incredible game!! At the time I loved the graphics and the RPG elements were well implemented and the sheer amount of games variants and modes were huge. I spent god knows how many hours on this game and it ranks in my GBA top five easily. 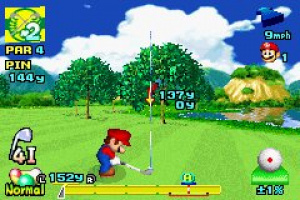 Would love to see them take this direction with a WiiU Mario Golf game.